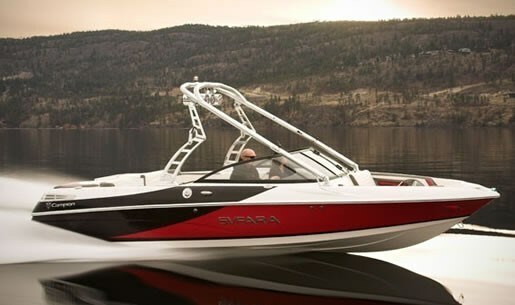 “Svfara Marine began with a group of individuals who share a common dream; to fill a void in the market by building a line of world-class tournament tow boats that exceed expectations for quality, design and performance.” Svfara Performance Tow Boats is part of Campion Marine of Kelowna, British Columbia, Canada’s largest independent boat builder, and exporters of a full line of thirty-seven different models of pleasure, performance, and sport utility boats from sixteen to thirty feet to over thirty countries worldwide. Campion Marine CEO, Brock Elliott, spent considerable time with Boatdealers.ca at the Toronto International Boat Show this past January to emphasize the differences that are built in to every Campion model, including the two models of Svfara professional tow boats. “We will never waiver on quality,” he said, “but we care about our environment, and we have taken our ‘lean’ manufacturing principles and are adding ‘green’ to it.” Campion was the first boat manufacturer in the world to use Envirez® resin in 100% of its boats. Envirez is a renewably sourced bio-derived resin from Ashland Performance Materials, one of the largest producers of resins in boat manufacturing, and is the first resin that uses a substantial amount of soybean oil and corn derived ethanol in its formulation. Campion’s choice of Ashland’s MAXGUARD LE (Low Emissions) gelcoats further reduces emissions. The foam flotation material that Campion impregnates in its hulls around its F.I.S.T. (Fibreglass Integrated Stringer Technology) stringer systems is environmentally friendly, toxic free Ecomate. Even acetone, long the mainstay solvent in the fibreglass boatbuilding industry has been replaced at Campion by Acrastrip which has been recognized in partnership with a division of the United States’ Environment Protection Agency (EPA). Even the foam used in Campion seats has a soybean base. There is no other major pleasure boat builder in North America that goes to the extremes that Campion Marine does to be on the leading edge of environmental friendliness and responsibility. Brock also wanted to emphasize the strength of Campion’s fibreglass layup process which utilizes “the most technologically advanced fibreglass mat available on the market today.” The 3D (3-dimensional) Weave uses less resin and requires fewer layers thus creating a lighter, stronger hull that Campion further reinforces with a layer of Kevlar® into the high impact area of the hull along the keel. Core-Cell, not balsa, is used as a stiffener where needed. The Svfara SV3 is all composite, sandwich Core-Cell construction, with all stainless steel hardware and aluminum floor boards with Euro-style, interior molded, vacuum-formed gunnels. “This boat produces the best wake surf in the industry,” said Brock proudly as we stood next to the SV3. 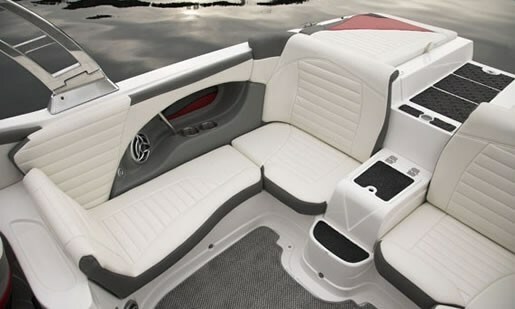 “It has the SV Quattro Ballast System integrated into the stringer system.” Everything about the SV3 is directed toward its role as a professional watersports tow boat from the integrated fibreglass swim grid with custom rubber inlay to the full complement of digital instrumentation including ambient air, ambient water, and engine temperature gauges to oil pressure, speedometer, tachometer, trip log, hour meter, digital depth sounder with alarms, fuel management system, and competition MV-3 speed control. Four Hella docking lights are standard as is a custom steering wheel and a black-framed compound curve safety glass windshield. You can pretty well go as wild as you want with specific towing options such as three choices of towers or the Perfect Pass Pro or different power options, to personal luxury options such as various stereo upgrades, filler cushions, a bimini top, a Heatercraft 3-vent heater or a hot & cold transom shower. Base power is a 330 hp Mercury MX 5.7 Black Scorpion inboard.